1:96 museum-quality model of USS O’Bannon (DD 450) by Fine Art Models. During the 2000s, Detroit-based Fine Art Models produced three 1:48 (i.e. 7' 10¼" LOA) models of the first Fletcher-class destroyer, Nicholas. 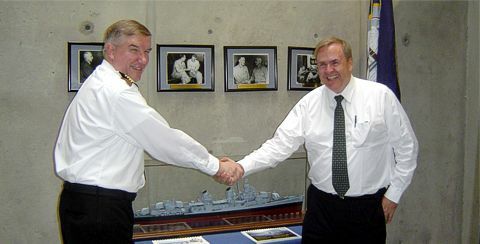 The models drew upon original Bath Iron Works engineering drawings, high-resolution versions of photos from this web site and shipmates’ comments. The firm chose Nicholas because of the combination of resources available: not only the relevant engineering drawings from Bath Iron Works and more than 700 photos, but also input from shipmates, which made it possible to differentiate colors, specific fittings and equipment present in August–September 1945, the period represented by the model. Nicholas’s career also spanned the history of the 2,100-ton Fletcher-class destroyers in the US Navy, and thus well represented the class. Earlier, the firm had produced 1:96 models numbered for other ships of the class. The image at the top of the page shows a model of O’Bannon.